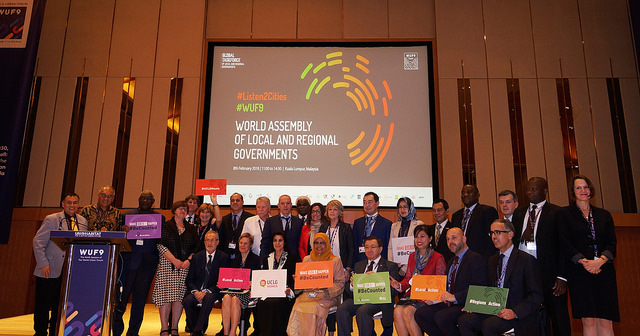 Local leaders call for the implementation of all global agendas at the World Assembly of Local and Regional Governments. 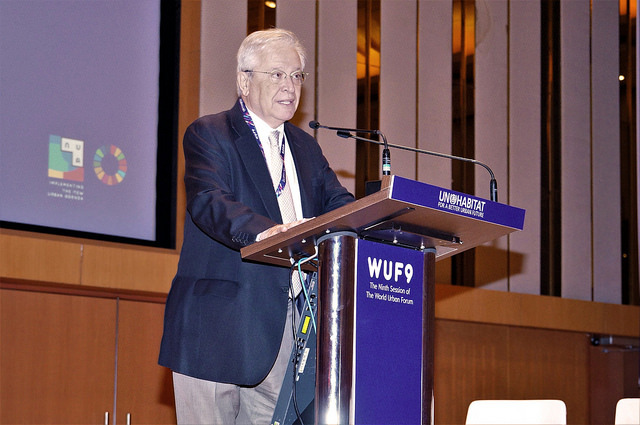 On 8th of February 2018, during the 9th session of the World Urban Forum (#WUF9), a delegation of over 200 representatives of local and regional governments gathered at the World Assembly of Local and Regional Governments to evaluate the implementation of the New Urban Agenda. UCLG Secretary General Emilia Saiz and UCLG-ASPAC Secretary General Bernadia Irawati introduced the first session. Saiz recalled the importance of the New Urban Agenda as an accelerator of the 2030 agenda and commented on the role of local and regional governments as the guardians of the Habitat III agenda and those who can best monitor its implementation. 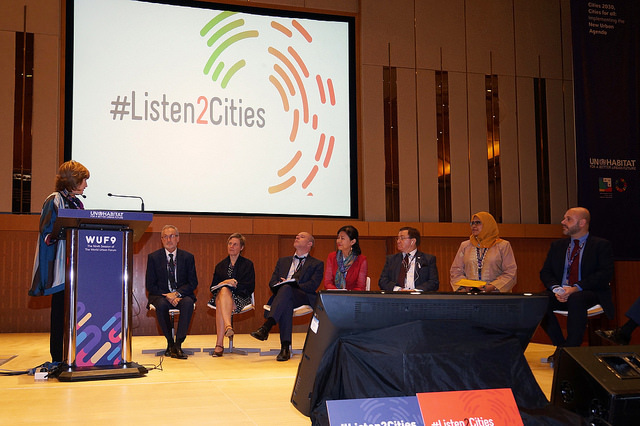 Bernadia Irawati addressed the rapid urbanization of the Asia-Pacific region and the need for the voice of local governments to be heard in an ever-changing environment. What can we expect of the implementation of the New Urban Agenda? During the first session, representatives of local and regional governments of the world expressed their expectations for the future of the implementation of the Agenda and what it would mean for local and regional authorities. Mayor of Kuala Lumpur, Tan Sri Hj. Mhd. Amin Nordin, addressed the audience by affirming that local governments are monitors and main actors when it comes to implementing the New Urban Agenda at the local level, and that, as such, “it is our duty to create a political commitment out of the of the New Urban Agenda and the SDGs, and we have to make a solution in order to implement them”. 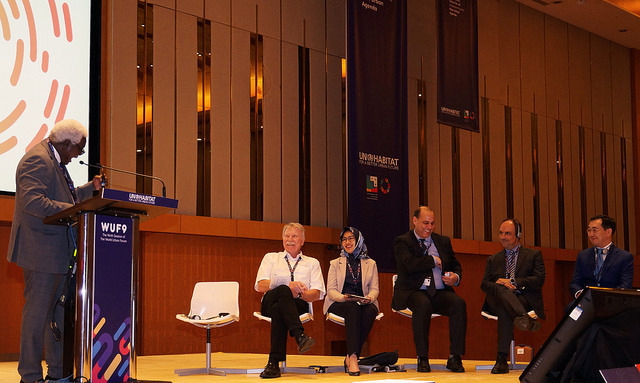 Datuk Ismail Ibrahim, Chief Executive of the Iskandar Regional Development Authority, stressed the importance of the role of cities and regions when talking about sustainable growth and talked about the experience of Iskandar. Tri Rismaharini, mayor of Surabaya, stressed the need for a new social contract which would put inhabitants at the core of the decision-making process and leave no-one behind. Both Carlos Martínez, mayor of Soria, and Ramón Mestre, Mayor of Córdoba, centered their statements the role of local governments as the closest authority to the citizens, albeit through different angles. The former addressed the need for transparency and openness when communicating with citizens whilst the latter argued for local governments to have a larger role at the table and for “networks in which cities can cooperate and share and work in consonance with each other”. The role of cities in global governance would also be expanded upon by Abdessamad Sekkal, president of Rabat-Salé-Kénitra Region, who called for complementary roles between different levels of government. Greg Munro, Secretary-General of CLGF set the theme for the session on governance of proximity. Munro stressed the need for a strong local governance within the framework of the New Urban Agenda and he argued that the issue of trust between different spheres of government was key in order to develop a joint governance. The role of local governments as governments of proximity was expanded upon in this session, with President of the Barcelona Provincial Council Mercè Conesa and mayor of Sala Carola Gunnarsson, referring to local governments as the level of government most familiar with the issues of their citizens and, thus, the ones which should be at the table and taken into account when implementing policies. Councillor of Cape Town Xolani Sotashe, spoke about the challenges african municipalities face when providing services to its citizens and how an increased role of local authorities on the decision-making process could help citizens have access to essential services. The need for dialogue between different levels of government was agreed upon by Datuk Ismail Othman, Executive Representative for Housing, local Government, Urban Wellbeing and Environment of the Melaka Regional Government, and Oswar Mungkasa, Deputy Mayor of Jakarta, who argued for the need for local and regional governments to be “provided with mechanisms of effective multi-level governance”, able to improve said dialogue. Where and how does equality fit into this discussion? Aicha Ivoukou, Vice-Mayor of Ksar, argued for addressing the issue of gender and women on the decision-making process, which effectively means doing the right thing and making sure their voices are heard in an overwhelmingly male environment. Partners of the Global Taskforce took the stage in order to discuss solutions. Dr. Victor Pineda, president of World Enabled issued a passionate call to action arguing that technical solutions weren’t the problem when designing more accessible cities, but rather the lack of political will. He argued for a global compact for accessible cities and encouraged cities to join and become more accessible. Katia Chirizzi, Acting Deputy Representative for South East Asia, in the Office of the United Nations High Commissioner for Human Rights, addressed the issue of the right to the city in urban areas in Asia. Former Executive Director of UN Habitat Joan Clos was welcomed and received the gratitude of the local and regional leaders. While addressing the assembly he acknowledged the decisiveness of the constituency and the great progress made to gather all organizations around the World Assembly. He encouraged the mayors and regional leaders to continue working internationally and towards getting cities right. The role of local and regional governments when assessing the implementation of the New Urban Agenda. Monika Zimmerman, Deputy Secretary General of Local Governments for Sustainability, recalled the commitments agreed upon in Quito, and introduced the round table on assessing the implementation of the New Urban Agenda and defended the need for integrated processes between different spheres of government in order to monitor and implement the New Urban Agenda. Mayor of Fukuoka Sōichirō Takashima introduced the audience to the energy projects in Fukuoka and how they are being used not just for energy creation but also for a more sustainable mobility through the city. Anders Knape, Vice President of the Swedish Association of Local Authorities and Regions, argued that the consultation process is still far from ideal, since local authorities are still out of the question and “most of the monitoring of global agendas has been done by national and supra-national levels of government”. Mayor of Mannheim Peter Kurz agreed with this somewhat pessimistic vision and argued for the implication of more than just the national authorities in monitoring the New Urban Agenda. Deputy Minister for Territorial Planning of the Basque Government María Aránzazu Leturiondo, however, had a more positive take and, after introducing the singularities of Euskadi in matters such as competences and financing, argued that it is precisely these competences and autonomy which are crucial in helping local and regional governments implement the New Urban Agenda. Director General for Planning and Urban Development of the Ministry of Territory and Sustainability of Catalonia, Agustí Serra argued for the integration of all global sustainability agendas, which would accelerate the process of localizing the SDGs. Mayor of Catbalognan Stephany Uy Tan highlighted the increased role of women in the New Urban Agenda and shared what local governments were doing in order to increase transparency. Key partners of local and regional governments such Clare Short, Chair of the Management Board of Cities Alliance, agreed that the New Urban Agenda could not be implemented without women, and took a step forward when introducing the themes of equality by arguing that the urban poor should be consulted and their opinions valued when implementing measures. Eugenie Birch, Chair of the Global Assembly of Partners, argued for multisectorial and multistakeholder partnerships when assessing the implementation of the New Urban Agenda. 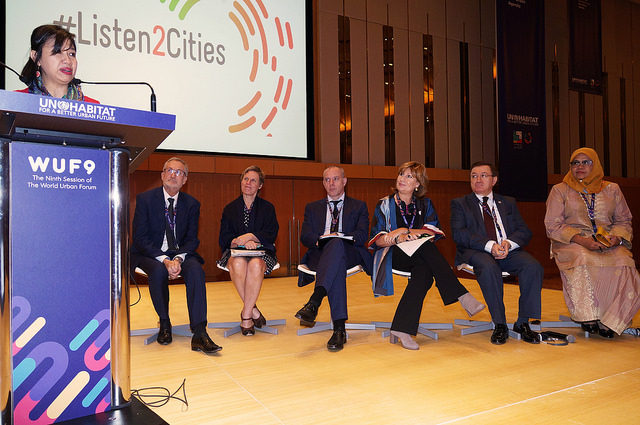 Corina Cretu, EU Comissioner for Regional Policy, encouraged national governments to work with their cities in order to implement the New Urban Agenda. Tackling the issues of implementing the New Urban Agenda in cities in crisis was a task for Mayor of Hebron, Tayseer Abu Sneineh, who shared the challenges he had encountered when implementing the New Urban Agenda in a divided city on many issues, and Airin Rachni Diany, mayor of South Tangerang, who addressed the importance on building accountability when implementing the New Urban Agenda. The question of sustainability and the changing role of cities was tackled by mayors of Yakutsk Aisen Nikolaev and Santa Fe José Manuel Corral, who argued for the need of local and regional governments to be sitting at the table to follow the implementation of global agendas. Mayor of Chefchaouen, Mohamed Sefiani, called for a greater participation of local and regional governments and specifically of intermediate cities, whose role is often undercut. Partners of local and regional governments analysed the joint efforts between local and regional governments and how these have can face the challenges ahead. As Lorena Zarate, from the Habitat International Coalition, stated, “if there is a reference to the right to the city in Habitat III, it is thanks to the alliances between the civil society and local governments”. Migration, its effect on cities and exclusion were other key points on the discussion of the role of local and regional authorities in the New Urban Agenda. Fatna Lkhiyel, Secretary of State of Morocco to the Minister of National Planning argued that exclusion can only be tackled by ensuring decent living conditions to all citizens. Jill Helke, Director for the International Organization for Migrations in the UN, addressed the key difference in how local and national authorities view migration: “States take migrants as numbers, whilst mayors view migrants as people”. Proximity is the crucial difference between the two perspectives, and it is this difference in focus what allows local and regional governments to rise up to the challenge. Ilmar Reepalu, Former mayor of Malmö and Chair of the International Committee of SALAR agreed with the vision that migration should be handled by local and regional authorities, and argued that, while the conditions and contexts of local authorities are very different, the often have similar challenges and work in the same ways. Local and Regional Governments call for the consolidation of the commitments agreed upon in Quito. After the sessions took place, members and partners of the Global Taskforce read the statement of the World Assembly of Local and Regional Governments, which started off by introducing the positioning of local governments, together with civil society, as guardians of the Habitat III legacy. Following this, the speakers reviewed some of the commitments agreed upon in the New Urban Agenda such as the inclusion of the reference to the Right To The City, a major victory since it introduces the concept into the global political agenda and the commitment of the member states to strengthen multi-level governance, which is a key requirement in order to ensure decentralization. Gender equality and the need to ensure women’s participation and equal rights in leadership at all levels of the decision-making process is also at the heart of commitments agreed upon in Quito, which means that the New Urban Agenda is a means to an end, but also a signal that we are not quite where we should be. The main challenge of fulfilling these, admittedly, ambitious goals set in the New Urban Agenda is ensuring that the political commitments which were taken in Quito come into fruition and can be implemented. Enhancing political commitment, and bringing member-states’ involvement into the proposals approved upon in Quito becomes a necessity, as does defining clear mechanisms which can bring local and regional governments into the monitoring and reporting process of the New Urban Agenda. The goals of the New Urban Agenda, global as they may be, can only be implemented in the local level, and bringing these actors into the table is fundamental in their accomplishment. Thus, the speakers addressed these issues and regarded of the commitment of UN member states to a 2-year process to conduct consultations, dialogues and analysis of the follow-up and review of the New Urban Agenda as the means to evaluate its implementation. What further commitments do we need? Local and regional governments reminded the audience of the measures which still needed to happen in order for the goals set in the New Urban Agenda to be achieved. A strong global governance, without the likes of which it would be impossible to place the citizens at the centre when designing policies, becomes mandatory in order to achieve global goals, as does listening to cities and increasing their role in the decision making process. Integrating the implementation of all global agendas and designing a renewed relationship between local and regional governments and the UN would further improve the implementation of these agendas at the local level. The statement concluded with a commitment to further contribute and consolidate the World Assembly of Local and Regional Governments. The newly appointed Executive Director of UN Habitat, Maimounah Sharif, welcomed the Mayors delegation in the morning and closed the World Assembly. 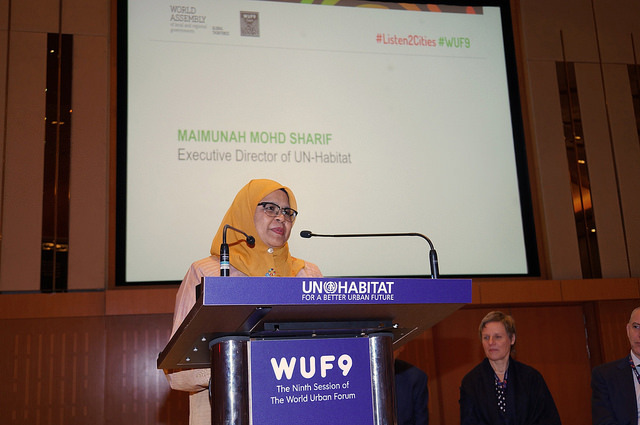 She recalled the many missions she had undertaken with the Global Taskforce and the important work of local and regional governments in order to transform the global agendas into concrete actions. She commended the efforts and celebrated to be among old and new friends in local governments. She further emphasized the need to ensure that no mayor is left behind and enjoys the capacity and resources to deliver, as well as a place where his or her voice can be heard. She stated that, without the partnership and commitment of local governments, it will be impossible to meet the SDGs, since the 2030 agenda is going to be implemented where people live and expressed her certainty that, working together, there was a way to make the spirit of Quito a reality.